The Tech West Ultra Clean Lubricated Air Compressor provides clean, dry and oil-free air you can depend upon. Fresh air intake filters remove dust and dirt and other airborne pollutants from even the busiest dental office environment. Tech West’s vibration free motors are designed for energy efficiency, enabling equipment to run without boost transformers thus minimizing operating and upfront costs. All compressors are equipped with energy efficient Copeland heads and large cooling fans which provide years of dependable performance. The Ultra Clean Lubricated Air compressor comes complete with moisture indicators, epoxy-coated tanks, rubber-leveling feet and handles for easy lifting and installation. 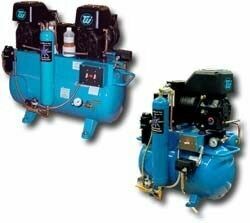 Available in single, dual or triple configurations, all compressors feature Tech West’s extensive warranty program along with full plumbing and design assistance as needed.